*Due to our large volume of requests, we respectfully ask that all event inquiries be submitted through our website using the “Contact Us” or “Request a Reservation” buttons. Please call for Banquet Hall and Catering Prices. 1) We have a mezzanine above the bar that seats up to 15 people. The mezzanine is no charge to our customers ordering from our menu. We do ask that you limit your party to two hours in that area unless previously discussed with management. 2) We have a second mezzanine above the Banquet Hall that seats 20 people. The back mezzanine is no charge to our customers ordering from our menu. We do ask that you limit your party to two hours in that area unless previously discussed with management. 3) Our Banquet Hall seats 54 or holds 100+ for a cocktail style “mix and mingle” party. The Banquet Hall has 6 flat screen TVs, a private bar, music, and private restrooms. The Banquet Hall comes with a private staff. 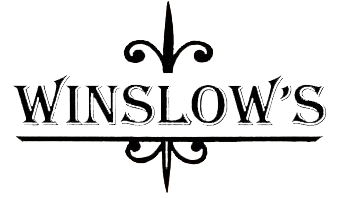 **Please Note - Winslow’s is a casual, busy and fast-paced environment. We cannot guarantee “quiet spaces” unless the private banquet hall and back mezzanine is rented for your meeting. No outside food or beverages with the exception of one specialty cake. We prohibit the use of our space for any activities that are illegal or deemed inappropriate for the establishment. Winslow’s is a smoke-free environment. Smoking is permitted only on our courtyard. We assume no responsibility for the loss of, or damages to, articles brought into the restaurant. Management and wait staff reserve the right to refuse or stop alcoholic beverage service to any individual or group at any time. We are required to enforce liquor laws at private events, including the prohibition of alcohol consumption by minors or guest without proper identification. Our license prohibits the donation or outside sales of any alcohol product. Alcohol may not be brought into or taken off premises except if unopened and purchase in our beer and wine market. Guests exhibiting rude or excessively loud behavior towards other guests or our staff members will be asked to leave. No refunds will be given if guests are asked to leave due to their poor behavior.